How does one ensure the safety of people in big crowds? The team of CrowdWatch was concerned with exactly this issue. 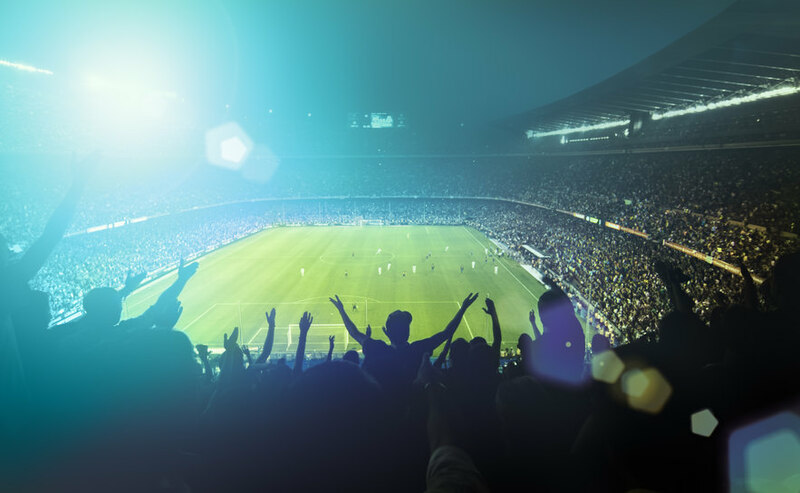 Using artificial intelligence, they developed a solution to support operators of football stadiums to identify potentially dangerous situations and provide a safe environment for football fans. But of course, there are many more use cases for such a technology in smart cities. Thank you for sharing some insights about CrowdWatch. In a nutshell: what do you do and what problem does this address? We pioneer an assistance system for the digitalization of security in stadiums with the help of artificial intelligence. Today, a handful of operators continuously observe tens of video streams from cameras all over the stadium to coordinate the security personnel. They identify conflicts, assess potentially dangerous situations and track persons of interest. All this is done manually and it is error prone. CrowdWatch supports operators in this process, allowing them to focus more on coordinating the security personnel. We are computer scientists, researchers in the field of machine learning. Our job is to find and prototype solutions for complex human tasks ranging from language understanding to human-like perception. One day, after reading about heavy incidents at a local derby (football game) in the newspaper, we started discussing how we can apply our know-how and research results to improve the situation. We developed focused prototypes to showcase what technology could do and initiated discussions with stadium administrations, the police and the federal commission for data protection and freedom of information. This is how the idea was born. How big is the team behind CrowdWatch and what backgrounds do you have? The team behind CrowdWatch consists of five people, four of which with a background in computer science and one in the field of economics. But as we are expanding, we are always looking for outstanding people who would like to join us. Your solution is intended for use in soccer stadiums. In which other areas could it be put to good use? Soccer stadiums and the video surveillance operators from the police as main users are our main priority for now. This being said, there are similarities between the use-cases we are working on and challenges in other fields like the topic of security in mobility and transportation, be it railroads or airports. Furthermore, smart data analytics, an important by-product of our technology is the main fuel for smart cities. Using artificial intelligence for security measurements is, of course, not restricted to sports stadiums. What are your plans for the future? Are there certain milestones you want to reach next? We are currently working on further developing our product. The next big milestone is in the first half of 2018 when we plan to deploy our solution and refine it for live usage together with a reference customer stadium. From there on, we plan to gradually expand in stadiums both inside and outside Germany as well as adapting the product to other use cases. Can you give us a little insight into how you first came into contact with artificial intelligence? Felix Geilert and I came in contact with artificial intelligence and particularly with machine learning during our university years. We were researching algorithms enabling computers to understand the meaning of words in the same way that humans do. We were lucky to have a brilliant mind as a professor, a mentor who inspired us to make research not only a job but also a hobby. What do you see as short-term and longer-term opportunities for artificial intelligence to impact the way we live? During the last few years, we saw great progress in the area of neural networks and deep learning. This mainly revolutionized the fields of computer vision and speech recognition. The effects already started to become visible: self-driving cars, augmented reality, intelligent security systems, autonomous drones, smart homes, intelligent personal assistants and last but not least smart cities, all these fields were boosted by AI and now present great potential for startups and investors alike. As a senior researcher in the field of self-driving cars, I can say that I am very excited about the future of mobility, about living in a smart city with seamless transportation, with no more traffic jams or searching for parking. But the AI revolution will improve our lives in many more ways than just transportation: it will find its way into our homes taking over chores like cleaning or grocery shopping, it will change the way we interact to the Web as a personal assistant helping us with our information needs, it will revolutionize healthcare, communication and why not entertainment. How do you perceive the current situation of artificial intelligence and smart cities? What is a development you are currently excited? Silviu: I guess, especially given my background I am most excited about the future of mobility and self-driving cars. However, from a broader perspective, be it mobility, last mile package delivery with autonomous robots or drones, or other kinds of urban automation, they all raise concerns about physical abuse and manipulation by ill intended people. From this point of view and as a part of CrowdWatch I am very excited about mitigating these risks with the help of intelligent security systems in the future. Felix: I would also add the general impact on smart cities. As the automatization of essential tasks like driving or delivering continues, more of these tasks will be available “as a service”. These services will provide a platform for many future startups. I, for one, am really excited to see the economy of tomorrow. The prime development towards smart cities today involves upgrading the infrastructure. Smart sensors are currently installed everywhere to collect data. The purpose is to ultimately allow a more efficient use of our resources. We already see or can expect to see in the near future small improvements in the direction of smarter urban living. The keyword here is connectivity: examples are interconnected streetlights starting to glow just seconds before someone enters their area, reporting and even predicting malfunctions for fast maintenance with no downtime or connected trash cans allowing for perfect coordination of the garbage collection service. Mid- and long-term, we should be able to see cities with highly interconnected systems working together to accommodate large crowds of people. Basic needs, like security medical services, food, water, energy, transportation and communication will have to be ensured in an agile and flexible fashion as the number of people living in cities continues to grow and large agglomerations become harder to predict. It is in this context that we see a need for products like CrowdWatch playing an important role in improving security in the future. How do you judge the overall career opportunities in the smart city sector? We believe there are good career opportunities today already and that they will increase in the future. “Smart cities” is all about big data mining and machine learning. Energy, mobility, healthcare, communication all these fields already need and will need even more data scientists or machine learning specialists. From our perspective, we can only encourage you to direct your study towards this area of computer science. Generally speaking, in order to have an impact in any domain one has to think big, to develop a product that improves the lives of millions of people every day. You can do this by working for a large company or as an entrepreneur. With the risk of sounding too general – as this is not specific to smart cities – one has to be passionate about his or her work. Technical skills, as well as being able to explain complex solutions with ease to non-technical people are very important traits. What advice would you give graduates who want to join the smart city industry or a smart city startup? We believe it is extremely important for every one of us to understand why we are doing what we are doing. What our motivation is and what drives us when things get tough. We would encourage every graduate joining a certain industry or start-up to formulate their motivation for doing what they plan to do as precisely as possible. To search and to engage in discussion with experienced people from the respective industry, to do a reality check of their expectations, to ask questions and finally to make an informed decision. The ideal candidate should have something he excels at. It could be technical skills or something else. However, above all, we value a strong sense of curiosity and the ability to share newly acquired knowledge with the team. This enables us as a company to develop and learn together. Felix and Silviu, thank you so much for this interview! Dr. Silviu Homoceanu is a senior researcher and project manager for self-driving cars at the Volkswagen Group Research. At CrowdWatch he is responsible for R&D. Felix Geilert is the Product Manager at CrowdWatch. He has a Master’s Degree in Computer Science with a focus on machine learning and scalable infrastructures. Looking for more interviews with smart city pioneers? AImotive is working towards global accessibility to self-driving cars. Everybody wants applications that run smoothly and securely. TeskaLabs sees to that. Learn about CleverShuttle’s vision of an innovative driving service, that is eco-friendly and low-priced and tailored to urban areas. Don’t miss upcoming news or job openings. Simply subscribe to our newsletter or follow us on Facebook and Twitter!